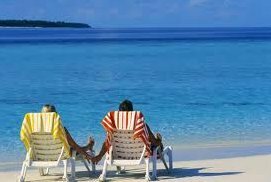 Well it was certainly a busy week for alternative technology vehicles – and that’s saying a lot given that it’s unofficially Vacation Time here in the USA. So here’s a list of the most interesting stories of the past week…. The Ports of Long Beach and Los Angeles were proud to announce some big numbers…. Long Beach has cut diesel particulates by 81% and sulfur oxides 88% since 2005. The port has also reduced nitrogen oxides by 54% and other greenhouse gases by 24% since 2005. Reasons mentioned in the report for emissions reductions include bigger ships carrying cargo more efficiently, newer ships with cleaner engines, implementation of the Clean Trucks Program, increasing use of shore power, and a new low-sulfur fuel rule for ships, according to its Emissions Inventory report. Port of Los Angeles just put out a similar report – the 2012 Inventory of Air Emissions. LA saw a 79% drop in diesel particulate matter since 2005. Moving cargo volume fluctuations from the equation showed the number was closer to 81% in reductions. The LA port saw a huge drop in sulfur oxides emissions (SOx) throughout the South Coast Air Basin. In this report, 6% of all SOx came from the Port of Los Angeles – way down from 25% in 2005. Nitrogen oxides also saw a big drop during the past seven years. The port has implemented several clean-air measures, requirements, and incentives to reach these targets. All transportation modes are included – ships, trucks, trains, cargo-handling equipment, and small harbor aircraft. In other Tesla news, the EV maker’s plans to enter the China market have stalled out for now. There’s a dispute over a trademark that Tesla needs to enter the market and set up a flagship showroom in Beijing. A businessman in China is claiming the trademark rights to the name. And….. Tesla hit $173 and then closed at $164.23 in stock price yesterday – that’s market value in excess of $20 billion for part of the day. Tesla competitor BMW is rolling out another plug-in concept next month at the Frankfurt Auto Show. The BMW Concept5 X5 eDrive plug-in hybrid is based on the BMW X5 SAV. It will be powered by a four-cylinder TwinPower turbocharged gasoline engine in tandem with a 70 kilowatt electric motor and a lithium-ion battery pack. The X5 eDrive will join the BMW i3 and i8 plug-ins in Frankfurt. California Energy Commission is seeking proposals for $4.7 million available in awards – three awards up to a little over $1.5 million each to be distributed among three regions – Northern, Central, and Southern California. The funds will support new or existing centers for alternative fuels and advanced vehicle technology. Winners of the awards will support a neutral site for companies to collaborate on technology demonstrations, with fleet managers expected to play a big role. In other government funding news, the new US Secretary of Energy, Ernest Moniz, said the feds may revive the $25 billion Advanced Technology Vehicle Manufacturing Program. That program has been on hold since March 2011 after two of the five companies that had received loans halted production. The DOE is looking at revising the loan solicitation process. Detroit Electric is sputtering in its manufacturing plans as the company that revived the historic EV brand has to yet to make an agreement for a plant in Wayne County, Mich. There was going to be a facility in Plymouth to make its electric sports car, but that’s failed to come together. Mercedes-Benz ordered 123 more hydrogen-based GenDrive fuel cell units to run forklifts at its logistics center under construction in Tuscaloosa, Ala. Last month, Mercedes bought 72 of these fuel cell lifts for its Tuscaloosa vehicle assembly plant. While some scoff at the term “clean diesel,” others would disagree. RL Polk & Co. says the US sales figures have gone up 25% between 2010 and 2012 and the number of these diesel-powered light-duty vehicle models will be going up from 27 models now to more than 55 in the next two years. Why is the momentum building for diesel passenger vehicles? Three main reasons: lots of appealing products to choose from; diesel engines are 20% to 40% more fuel efficient than comparable gasoline engines; who cares of diesel is pricier than gasoline? Automakers like them for the 54.5 mpg by 2025 fuel standard mandate and consumers have more confidence in them now. The Volkswagen Golf TDI and Jetta TDI impressed a lot of people as high performance and fuel efficient, and led the way in diesel adoption. Google poised to profit from self-driving cars: Mega-automotive supplier Continental AG is now in alliance with Google and IBM to build autonomous driving systems for cars. Continental has a similar deal with Cisco Systems for automated/driverless cars and data transfer between automobiles. Google has been in this game since 2010, providing test results from California highways and played an important role in the state of Nevada doing its homework and becoming the first state to adopt a self-driving car testing program. EVCARCO Inc.., an up-and-coming dealer network offering green vehicles, has launched its EV Leasing Program. The company wants to support increase in demand in the US for new and pre-owned electric and hybrid vehicles available now in the US. CEO Walter Speck said the EVCARCO has submitted licensing to solicit consumers to enter into a lease of new or pre-owned models, which include the Chevy Colt, Nissan Leaf, Teslas, BMWs, Toyotas, and other alternative fuel vehicles. We’ve certainly seen quite a few startup OEMs and battery makers go belly up in the electric vehicle space in the past three years. To survive and thrive in this newfound industry, building reliable, high performance product, marketing and “messaging” in a way that resonates with the core audience, and having solid financials, are key ingredients. His initial company, Liberty Electric Cars, was acquired last year by GAC and brings about eight years of experience in the European market to the table. It’s been delivering electric vehicles to customers in Europe for several years, and has other diverse offerings on the market including all Electric Range Rover conversions. In November, Newport Coachworks will start building electric shuttle buses at its production facility in Riverside, Calif. 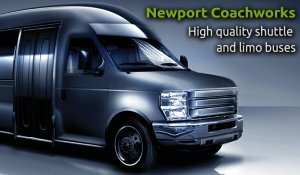 The Newport Coachworks team has been in the bus market for years and was recently acquired by GAC. While most of the buses in chauffeured transportation tend to be converted from Ford E450 or F550 platforms, Newport Coachworks will be building its own electric buses from the ground up. Newport is tapping into Liberty’s experience delivering electric vehicles to parcel delivery and postal fleets, and to plumbers, gardeners, decorators, and other business customers. The shuttle bus is powered by an 80 kilowatt battery pack that goes about 100 miles on a charge; the A/C unit doesn’t need extra power during the trips as it has its own source, Hobday said. What GAC is finding out is that customers appreciate the cost per mile differential with electrics buses – 14.5 cents per mile for typical shuttle buses and 2.5 cents per mile for electric shuttles. Drivers also love the fact that the electric bus has no vibration or noise – they feel more relaxed while doing their jobs, Hobday said. A number of clients have been using GAC’s drivetrains in their own vehicles, including OEMs in Europe. They’ve also been accessing the Liberty E-Care service offering, which provides service and support for EVs already on the road, from trained and skilled technicians equipped with customized diagnostic tools. GAC found California to be a smart place to launch its electric shuttle buses in the US market. It’s the largest market so far in the US for electric vehicles, and there’s incentives and support for the technology within the state. The company is also focused on getting as close to 100% as possible in using American parts and labor in its vehicles. GAC has been working with manufacturers of lithium ion battery cell makers such as Dow Kokam on its electric Range Rovers. GAC wants access to inherently safe, high energy density cells from US suppliers. “Why go to China? It’s much cheaper, but the failure rate is higher,” Hobday said. GoinGreen is GAC’s retailer network in the UK. It offers a wide gamut of EV products – city buses, bikes, scooters, and city cars. It will be coming to California then launching a global rollout. As GAC acquired Liberty and GoinGreen, the idea was to consolidate operations, reach economies of scale, and to cover all the basics – from manufacturing electric powertrains and conversions, servicing the vehicles, and expanding retail store fronts. GAC serves the internal combustion engine sector, as well. As GAC and other thriving players in the EV market (i.e., Tesla Motors) know very well, good solid profits are required for EV makers to survive and thrive. How accurate and truthful are automakers and EPA being about mileage ratings? Fallout from the fuel economy ratings on the Ford C-Max hybrid has caused the US Environmental Protection Agency to rethink how it calculates mileage. The EPA window sticker mileage rating labels go back to the 1970s, and disparities have widened as more hybrid and electric vehicle models have come to market. Consumer Reports and analysts are taking automakers to task for fudging on fuel economy numbers as OEMs push for fuel economy improvements to comply with strict federal standards. EPA says it will work with consumer and environmental groups and automakers to propose revised fuel-economy testing regulations. It’s understood that the ratings need to be reliable. 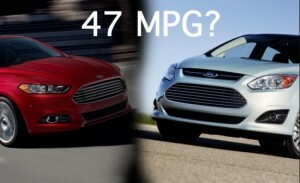 Ford has changed the combined rating on its C-Max from 47 mpg to 43. Ford is also offering C-Max owners reimbursement cash payments for additional fuel consumption. Consumer Reports is still staying on top of the controversy and just released a chart showing its own mileage testing data versus what the EPA lists for 14 vehicles. EPA test results showed them that the agency used a mathematical derivation formula in lieu of an actual test. EPA doesn’t publish the formula that it uses, but it is using the formula for EPA mileage ratings on more than 80% of all cars. Ford and Lincoln had the widest gaps in their EPA ratings versus Consumer Reports. Along with the controversial gap between the C-Max hybrid and Fusion Hybrid ratings, two other that made the list were the Fusion Titanium (2.0T) that 26 mpg overall EPA rating versus 22 from Consumer Reports. The Lincoln MKZ 2.0 with EcoBoost had an EPA rating of 26 and a CR rating of 23. The Chevrolet Traverse had an EPA rating of 19 mpg and a CR rating of 16 mpg. Volkswagen Golf TDI got better CR ratings than EPA – 38 vs. 34, and Volkswagen Jetta SportWagen TDI had 36 vs. 34. The Nissan Frontier, Nissan Xterra, Lexus ES 350, Toyota Avalon Limited (V6), Toyota Land Cruiser, and Toyota Sequoia were very close to being exactly the same – sometimes just one mpg off. It looks like the EPA and automakers have a ways to go – especially Ford – in gaining back confidence from car shoppers on accurate mileage ratings. Ford Motor Co. and General Motors have been recognized for making manufacturing plants more energy efficient, reducing landfill and water consumption, and powering plants with renewables. Competitors have been getting the nod lately, as well, for changes being implemented at US plants. Honda is working on a test track facility using 70,000 solar panels and selling the excess renewable energy. Subaru has installed a zero-landfill, 100% recycling policy at its Lafayette, Ind., plant. In Chattanooga, Tenn., Volkswagen opened a 9.5 MW solar park with 33,600 solar modules capable of producing 13.1 gigawatt hours per year of electricity. Toyota prides itself for having the most clean energy patents in one year – with 207 being filed in 2012. Honda is taking the lead this year on clean energy patents and registered 87 patents in 2012. Renewable natural gas just took a step forward. Pierce County, Washington, (covering Tacoma and Olympia) has been converting its transit bus fleet over from compressed natural gas to renewable natural gas. Pierce Transit gained EPA approval to fuel its bus fleet with RNG – 143 of its 155 buses are now being powered by RNG made from the biogases from the Cedar Hills Landfill in nearby King County. It’s the first municipal transit fleet in the country to utilize this alternative fuel, and probably one of the first large organizations to bring in RNG. Another company in the EV supply chain may be heading for bankruptcy – Ecotality. The DOE has put Ecotality’s request for more federal funding on hold after the charging station supplier company stated that it’s having trouble getting financing and may have to declare bankruptcy. Ecotality outlined its problems in its latest SEC 8-K filing. Ecotality has been depending on the DOE funds — $100 million had come through, nearly all of which has gone into the federal EV Project. AFVResale.com is offering a service to alternative fuel vehicle owners that plays a major role in acquisition and lifecycle cost analysis – resale values. Launched last year, the site is offering a platform for alt-fuel vehicle owners, primarily fleets, to remarket used green vehicles and for buyers to find competitive deals on vehicles that are not easy to find at auctions or dealerships. 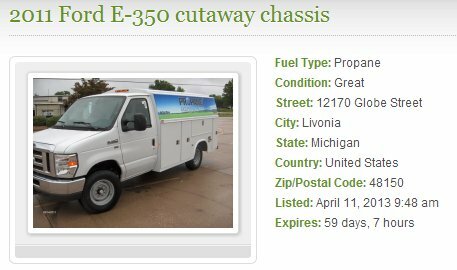 Propane autogas-powered vehicles has been the leading category on the site so far. Greg Zilberfarb, CEO and president of TSN Communications, the parent company of AFVResale.com, has worked closely for several years with leading companies and organizations in the field, including Roush CleanTech and Propane Education & Research Council; TSN Communications has worked with other alternative fuel organizations including the National Biodiesel Board. Electric vehicles have also been sold on the site. Cummins is using the site to market its Ford compressed natural gas unit vehicles, and sales have been taking off, Zilberfarb said. Icom North America has also been selling on AFVResale.com, primarily propane-powered school buses in alliance with its partner, bus maker Blue Bird. Sellers are listing a number of used vehicles for sale, such as a propane-powered 2012 E25D Cargo Van. Buyers can find specification details to answer their questions and find out where the vehicle is located. AFVResale.com was designed to be a straightforward platform for buyers and sellers to meet and do business. Zilberfarb says it’s a very simple sales process where anyone can create an account and post pre-owned alternative-fuel vehicles. Buyers can make a bid directly to the seller through the posted contact information. Vehicles are usually listed with photos, and buyers can contact the seller to negotiate the selling price. It’s a good platform for companies in the business to market themselves through detailed vehicle listings and photos, and through paid advertisements on the site. Zilberfarb sees volatile gasoline and diesel prices as the key market driver for remarketing alt-fuel vehicles. The number of visitors to AFVReseale.com continues to increase. Zilberfarb is enthusiastic about the site being home to a growing community of alternative fuel vehicle buyers and sellers looking for the best opportunities in the marketplace. BMW says it’s not taking on Tesla for luxury EV buyers, but who’s kidding who? “Revenge of the Electric Car” was a must-see in 2011 – the sequel to the influential “Who Killed the Electric Car?” shifted gears and explored who might become the iconic leader of the reincarnated electric vehicle market – Tesla’s Elon Musk, GM’s Bob Lutz, Nissan’s Carlos Ghosn, or custom electric car do-it-yourselfer Greg “Gadget” Abbott. While watching the movie, I kept wondering: What about BMW? BMW was testing out the Mini E with US drivers during the time the Nissan Leaf and Chevrolet Volt made it to the market. Next came the BMW ActiveE and now the BMW i3, and the i8 plug-in hybrid is next. Maybe the problem was the German automaker didn’t have any recognized US “car guy” celebrity to star in a movie? 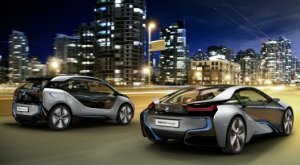 Well, the game is changing and BMW is poised to take on Tesla Motors for market share in the luxury electric vehicle market – even if BMW or Tesla doesn’t admit that being the case. BMW says that’s its upcoming i8 sports car is not competing directly with the Tesla Model S. It’s a supercar of the future with the driving performance of the BMW M3, and the plug-in hybrid gets more than 80 miles per gallon, BMW says. The i8 is being shown at the Frankfurt auto show next month and will go on sale in the US in early 2014. Pricing hasn’t been released but it’s going to be steep – something less than $150,000. BMW is obviously paying attention to how well the Tesla Model S has been doing this year in sales performance. BMW says that the i8 and Model S will be reaching different buyers – but both automakers are clearly targeting sophisticated, high-income consumers. Incentives/rebates do apply, but that doesn’t really matter much at these price points. Leasing takes some of the edge off of it, but it’s still got a limited market potential. German luxury automakers have known this for years but have been committed to battling competitors (including Japanese luxury brands) for more share. What about the BMW i3 versus the Model S? It doesn’t appear to be competing directly with the Model S. The i3 is a hatchback with a starting price of $42,275 versus the Model S sedan that starts at about $70,000. It might be more comparable to the Tesla Model X crossover that will be launched in 2014 for a starting price around $35,000. Tesla says it will go 200 miles on a charge, while the i3 gets 80 to 100 miles on a charge. The i3 is getting a lot of raves out in the automotive media and cleantech space – it’s the first in the series of BMW electric cars and the German automaker has been masterful at marketing its image – tying into BMW’s legacy as a high-performance carmaker and also tapping into the grand theme of global urbanization, as depicted in the photo above. During a recent investor quarterly conference call, Tesla CEO Elon Musk chuckled when asked by an analyst about the BMW i3. It wasn’t clear what was so funny with Musk and a group of co-workers inside the conference call room, but he is known for putting down competitors (just ask Henrik Fisker). “I’m glad to see did BMW is bringing in electric car to market. That’s cool. There’s room to improve on the i3 and I hope that they will,” Musk said. Big Picture: Will Elon Musk gain business from Hyperloop? 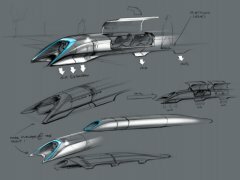 Hyperloop: Telsa CEO Elon Musk stirred up a lot of curiosity over the past year for the unveiling of his Hyperloop high-speed rail concept yesterday. It boils down to flying through a steel pipeline; take a look at this 57-page report. It’s a concept that won’t necessarily be carried out by any of Musk’s companies such as SpaceX, but it is intriguing. Musk says he is releasing the designs as an open source project in hopes of optimizing the design and bringing down costs. The high-speed transit solution could go from Los Angeles to San Francisco in 30 minutes and would cost $6 billion – compared to the $68 billion budgeted for the state’s high-speed rail project. It would travel along the state’s I-5 and I-580 highways and reach top speeds of 760 miles per hour. The capsules, or pods, could carry up to 28 people and each person could bring two bags. The trip would cost them about $20 one way. Musk recommends that it be built as a low friction suspension system traveling with a cushion of air from the pod using the same air bearings principle used in an air hockey table, instead of wheels. His team thinks that a battery used to accelerate the pod would be drawn not from the battery pack (that battery would circulate air in the pod); instead an external linear electric motor with a round induction motor, similar to the one used in the Tesla Model S, would deliver that power. Perhaps Tesla would provide an electric motor? There is probably some potential business opportunity for Musk and his companies — similar to Google funding and delivering driverless Toyota Priuses to states testing out autonomous cars. There’s got to be some technology applications that Google and Tesla can provide. Neapolitan Express is leading a campaign to bring natural gas vehicles to food delivery vehicles in fleets across the country: Everything is powered on natural gas, instead of propane for food heating and gasoline or diesel for the truck’s engine and the motor powering air conditioning and other features. The food truck produces 70% less carbon emissions and reduces fuel costs by 60% over gasoline and diesel-fueled versions. Company owner Max Crespo unveiled the Neapolitan Express in February alongside New York Mayor Michael Bloomberg and Clean Energy Fuels Corp. founder T. Boone Pickens. In partnership with Clean Energy Fuels, Crespo is now rolling out the concept across the country, according to ClimateWire (subscription required). Cellulosic ethanol reaches commercial production: The US Environmental Protection Agency is adjusting the Renewable Fuels Standard (RFS) in order to reflect market realities. The rule previously called for 14 million gallons of cellulosic ethanol, but the final rule reduced the number to six million gallons of cellulosic ethanol this year. While coverage has stated that the EPA backed down, the cellulosic ethanol is actually becoming a tangible biofuel industry with commercial production starting up. KiOR started commercial production in March using wood chips to produce cellulosic fuels, and Ineos just announced that their Indian River BioEnergy plant in Florida has begun operations to make biofuels from plant waste. Both of these are now operating at full commercial scale. 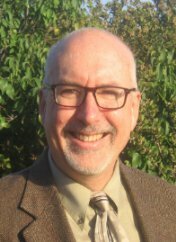 Attention Fleet Managers — Sell green vehicles as part of GHG emissions reduction strategy: Major aerospace company Northrup Grumman just released impressive numbers on reaching its greenhouse gas emissions reduction targets – the only problem is that it had nothing to do with transportation. The company reduced GHG nearly 27% in three years – two years ahead of plan. 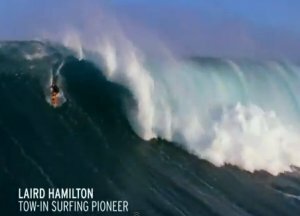 How was this accomplished? An environmental sustainability program that covers facilities, engineering, and manufacturing efficiency projects, a green information technology strategy, real estate optimization, renewable energy, and ecosystem conservation. Not a word was said about its fleet vehicles. Fleet managers have been thinking about installing electric vehicle charging stations on campus and looking at green vehicles like its fleet management counterparts, but so far that hasn’t happened. Green and alternative fuel vehicles aren’t ready to take over new vehicle sales. What’s next? While reviewing the state of the US auto industry in new vehicle sales, it’s easy to get depressed about the condition of electric, hybrid, and alternative fuel vehicles. Hybrids and EVs were a little bit over 4% of about 1.3 million new vehicles sold in the US market in July. Sales and of new and converted natural gas vehicles, propane autogas, hydrogen fuel cell, and biodiesel vehicles ran in small numbers (maybe 0.5% of the total). Tracking flex fuel/E85 numbers are not worthwhile since the adoption rate for fueling them on E85 ethanol runs pretty low. The grand vision commonly expressed by government officials and advocacy groups of green/alternative fuel vehicles making up 50% of new vehicle sales by 2050 seems insurmountable at times. But it’s good to keep things in perspective. Energy & Capital put out one of its usual snarky stock market analyst pieces on plug-in electric vehicles; yet managing editor Jeff Siegel did have some fairly positive things to say about their potential. Federal and state tax credits play into it and will be around for a few more years. 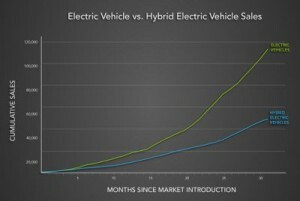 He makes the point that EV sales are impressive so far compared to hybrid sales in their early phase. Approaching 25 months on the market, EVs are hitting the 110,000 total new vehicles sold so far. At that same period of 25 months after market introduction, hybrids were only at about 50,000 units sold. 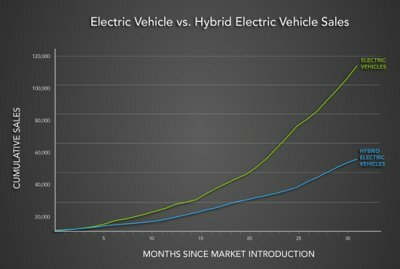 So after another 10 years, EVs should be making up a larger percent of total sales. Hybrids are at about 3.5% of new vehicle sales and EVs could be around 5% to 6% of total sales in about 10 years at its growth current rate. Both numbers are expected by several analysts to be wider going forward. Maybe they’ll both be about 10% of new vehicle sales by 2025 reaching 20%? It’s all possible and other segments could be part of it, such as hydrogen fuel cell vehicles. Maybe other advanced fuels and technologies will take hold and see some substantial numbers as well. Making it to 50% of all new vehicle sales would make for a massive transition. It could be that looking at the numbers will have to change. What if the US and other major markets hit their targets for highly fuel efficient vehicles (or somewhere near the mark – 45 miles per gallon may not be 54.5 mpg but its way better than 24 mpg). If green/AFV numbers made up to 25% of new vehicles sold and internal combustion engines were reaching 40+ mpg, it would be a much better environment. Mazda has yet to offer any plug-in, hybrid, or alternative fuel vehicles – so its SkyActiv technology is its best bet for meeting federal fuel economy and emissions standards – and for upping its green credentials. Mazda says that the smartness of SkyActiv boils down to highly fuel efficient engines with great compression ratio; ideal transmissions; reduced vehicle weight; safety performance; and a clean diesel version. While Mazda’s sales were slow in the first third of 2013, Mazda credits SkyActiv for starting to pick up the numbers again for its all-new 2014 Mazda6 and versions of the Mazda3 and CX-5 utility vehicle. It’s too early to tell if SkyActiv is making much of a difference; those models were already doing well in their vehicle categories, but sales have picked up for the automaker and SkyActiv is the main focus of its marketing campaign. Compressed natural gas (CNG) and liquefied petroleum gas (LPG) nearly have nothing to do with retail light duty passenger vehicles, with the exception of the Honda Civic Natural Gas Vehicle (which has only been sold in very small numbers to retail buyers so far). Now, when it comes to fleets, natural gas and propane autogas-powered trucks are a very big deal. Ford Motor Co. is adding to alternative fuel vehicle offerings with CNG and LPG options for the 2014 F-150 pickup truck. Ford will become the first automaker this fall to offer both a CNG and propane autogas version of a half-ton pickup. Ford expects to sell about 15,000 CNG-LPG vehicles this year. Chrysler and General Motors are offering bi-fuel trucks that can be powered by either CNG or gasoline. Fleets like the alternative fuel trucks for the cost per mile – about a third of gasoline and diesel and reduced emissions compared to conventional trucks. The challenge has been seeing enough product offerings on the market and a refueling infrastructure outside the fleet’s home base. Ford’s announcement is good news for advocates of the alternative fuel and technology. On the subject of CNGs, Nissan is bringing a CNG pickup truck to the Thailand market. There are expectations that alternative fuel vehicles will be seeing an increase in Asian markets, especially through government-funded projects aimed at reducing air pollutions and vulnerability to fuel price volatility. The Nissan Navara CNG is the company’s first bi-fuel CNG-gasoline engine. It’s powered by an engine that generates 154 horsepower at 5,200 rpm. The new Navara CNG will reduce running costs by two thirds compared to a conventional gasoline engine, Nissan said. 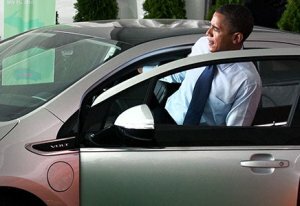 Chevrolet has cut the Volt’s price by $5,000 for the 2014 model year — down to $34,995. The 2013 model had already been cut by $4,000. Sales had been down slightly last month; while sales are up more than 9% for 2013, Volt sales are still behind the Nissan Leaf and Tesla Model S in the battle for the top spot in the plug-in market. So, the price war continues…. Hey gang, haven’t signed up for the free Green Auto Market Newsletter yet? I’ve added a subscription link on the homepage in the past week, asking for first and last name and email address (see column on right-hand side). I encourage you to sign up and share it with colleagues interested in the business of green cars, fuels, and technologies. Thanks! Hurricane Sandy raised hackles for locals living in places like New Jersey last year. Power outages wreaked havoc for residents and employers in ways that tend to get forgotten about until the electricity disappears. Plug-in hybrid truck maker Via Motors has been working on a “power export” offering with Pacific Gas & Electric. The Via pickups can be hooked up to supply electricity for urgent situations, such as a home or medical facility that needs electricity to respond to an emergency. The two companies are working on a Via Motors VTRUX, a range-extended truck with a 300 kilowatt traction motor, 150 kW generator, and 4.3L, V6 engine. It’s able to power 120V and 240V power outlets, which can power tools and export electricity as needed. Connected cars and telematics are a competitive battleground for third parties like Microsoft and Pandora Media, and now Apple is competing for space. By the end of this year, car shoppers will be seeing several vehicles with Apple’s iPhone functions that use Siri voice controls for navigation, texting, emails, and music. It takes a lot of testing and hard work to make these technologies work the right way in cars – and suppliers typically fail to deliver it, according to the Car Lab consulting firm. Automakers know many consumers already use their iPhones as a substitute for built-in navigation systems. The trick for automakers is figuring out a good way to pair the iPhone to their cars in a way that avoids driver distraction and increases user satisfaction. The Chevrolet Spark and Sonic small cars offer Siri, but it hasn’t done well so far in reviews. So Apple has a big challenge ahead, and it will get a lot of attention from connected car analysts.